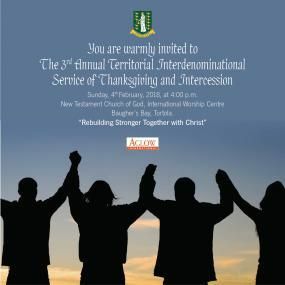 BAUGHERS BAY, Tortola, VI - The Government of the Virgin Islands, in collaboration with Aglow International Virgin Islands chapter, is inviting the public to its Third Annual Territorial Interdenominational Service of Thanksgiving and Intercession on Sunday, February 4, 2018 at the New Testament Church of God International Worship Centre in Baughers Bay, Tortola, at 4:00 PM. The aim of the prayer service is to pray for the leaders and people of the Territory. The theme for this year is ‘Rebuilding Stronger Together with Christ'. In a press release from the Department of Information on February 1, 2018 it was stated that the service is designed to bring the community together and collectively thank God for his protection through 2017 and to invite his guidance, protection and favour on the Government and the people of the Territory in 2018. Premier and Minister of Finance, Dr The Honourable D. Orlando Smith (AL) is encouraging Territory-wide participation in this worthwhile initiative as everyone unites to pray on behalf of the Virgin Islands. 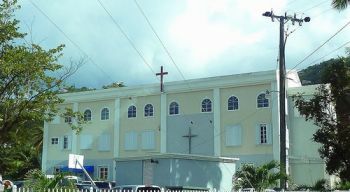 Aglow International Virgin Islands chapter is the local branch of a worldwide Kingdom Ministry committed to "seeing God’s will done on the earth as it is in heaven." The local chapter of Aglow International meets on the last Saturday of each month at Fort Burt Hotel’s conference room at 3:00 PM. It serves as an extended arm of churches and offers avenues for spiritual growth and development for believers through monthly meetings, Triple Cord Prayer Groups and charitable outreach in the community. Meanwhile, a number of residents have stated that government needs strong prayers so they can make sound decisions when it comes to the territory's finances. "This is the third year for this prayer service and the government is still the same. Why you think Irma come so strong and wipe we out clean?" asked a disappointed resident. According to Sheena C. McClure, "As far as I can see the annual prayer service is not working because they are still misusing our money and not taking care of the residents," while noting that she has lived in the territory for 20 plus years and the issues have remained the same. "All I have to say is the government, no matter which party is in power, need some really strong prayer intervention to take back the territory," expressed Mr Robert A. Wright, a taxi driver. We pray that they leave office now! Has God got a backhoe? The have gotten that from the ppl twice already. Have they done any better, NO, it has gotten worse. They need to get out of our House of Assembly and someone else a chance. What this place needs is some discipline , accountability and action. Prayer. Hmmm. Sensible people that know right from wrong and choose to do wrong what prayer has to fo with that.. Its these fake evil people that say they praying causing all these curse.. All those prayer and worshop couldnt stop maria or Irma.. We just need to do what we know is right.. So praying for the country is the right thing to do don't you think *lord o* that's what you call yourself. After Irma God is an on time God don't stop praying. The government need our prayers this is the only thing that chachanges things. when we. Pray I want to tell you be specific and tell God the areas where change is needed. What is really affecting the territory and our leaders. It's crazy to hear this when members of both parties sought the services of enchanters and observers of time. The one who just passed was well known for seeking Mr. Pickering services. So I do not think prayer will help all of their ill deeds for all these years. Lets be careful: prayer without works is dead. Prayer without honesty can surely lead to corruption. Prayer without a plan leads to disarray. Prayers yes but who is going to be a nathan to the david and say you are the man; "you are the Government thats refusing to answer legitimate question and reapond to we the people issues. Prayers yes but we need works.....we need to hold these men to the standard of The One we are praying to,God! You are absolutely right. YOur post is the most sensible post on this topic so far. If you are reading this devotional, it is not by chance and please read it to the end. God is about to expose major, major things in the Body of Christ not just in this nation (USA) but also in the Caribbean and the world! Apostles, Bishops, Pastors, Prophets, Ministers, Teachers, Preachers, Deacons, Board Members, members, non-members etc. – the covers are about to come off. Judgment has begun in the houses of the Lord in this nation (USA) and in the Caribbean. God has been merciful and given many times and time and time and space and space to repent but pride, pride and heady and high mindedness have prevented many from repenting privately, or publicly or openly confessing and stepping down from their posts to get the deliverance and help that they need to save their souls from destruction. God is not mocked and neither is he fooled. Whatever we sow, we reap! God has been speaking through many messengers to warn us as a people to repent and get right with God. God is merciful and warning always comes before judgment. God is calling for Genuine National Repentance! Some prophets, pastors and prayer warriors have been seeing and saying the same things, which makes the words even stronger confirmation! But are we taking heed to the word? Many have mocked and have said how they are all the messengers of God are false and they continue in their sin; instead of thanking God for His mercies and giving us as a people another chance to humble ourselves, pray, turn from all wicked ways, repent that our nation be healed. We are all aware of what happened in some of the Caribbean islands, in some states in the USA last year. Yet in the midst of all the devastation and deaths, we thank God for mercy. God is still with us! Saints of God and Prayer Warriors in this nation and throughout the world, we must continue to fast and pray for our land, our governments, our families, our churches, our social sectors and ourselves like never before! The call is for each of us from great to small, tall to short, educated to illiterate, high status to low status, church goer to stay at homers to get right with God! If you are reading this devotional, it is not by chance. God is speaking to you! Is your heart right with God? We are very much aware that some people wish we would just shut up; but beloved the blood of none will be required at our hands! We will continue to say what God tells us to say! In the midst of all that is happening and about to happen; God is about to (beginning from this week), do supernatural miracles, in the lives of and on behalf of the righteous! God is about to rain down blessings on His faithful remnant! From this week saints, watch God move mightily on your behalf with miracles, signs and wonders that only He can do. February 14, 2018 will be a special day for many of the faithful but it has nothing to do with the fact that it is Valentine’s Day, it is a day of DIVINE RELEASE! What God is about to do, nothing or no one can stop it! I PRAY YALL GO AWAY AND LET TORTOLA GO BACK TO BUSH NO BLACK OR WHITE JUST THE AMERIDIANS..THE FIRST PPL BEFORE THE REST.